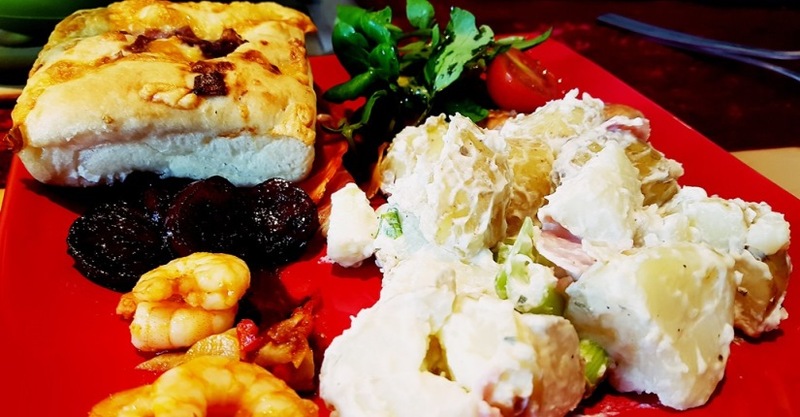 Wimbledon seems like ages ago, and it appears I forgot to blog about the ridiculously awesome array of food I produced for the house warming we had for the final! In honour of my moving in, TC and I decided to do a sophisticated daytime tennis viewing (a House Wimbledoning, if you will) rather than a raging house party, mature adults that we are. We invited over a few of our best friends, and promised an afternoon of food, Pimms and Andy Murray. If you’re here for the recipes – scroll down! The most important thing to get right at a Wimbledon party is, naturally, the Pimms. We had ours two different ways. Keeleigh’s fiancé Kyle suggested that we open the bottle of Prosecco they brought (ALWAYS Prosecco over Champagne any day) and top it off with a little bit of Pimms and a strawberry. It was absolutely yummy and a perfect celebratory start to the afternoon. Then we moved on to the more standard Pimms and lemonade. I often omit the mint and cucumber but this time I went the whole hog – strawberries, lemon, lime, strawberries, mint and cucumber, mixed up with 3 parts lemonade and 1 part Pimms. Now, I’ll admit, I went a little overboard. It was amazing. And I’d like to share the recipes for three of the dishes. Guess which three! This has got to be my favourite Spanish tapas dish ever. Like, the best in the world. I will forever strive to be as good as the Cha Cha Chorizo dish at Las Iguanas (tragically no longer on the menu). The chorizo should be slightly crispy on the outside but melt-in-the-mouth too – the key is to fry it up nice at the start, and then cook it as long and slowly as possible. It would make a great starter for my paella dish! Serves two as a starter with a little crusty bread to mop up the sauce. Peel the skin off the chorizo and chop into slices about 5mm thick. Heat the olive oil in a saucepan over a high heat, then add the chorizo. Fry for several minutes until starting to crisp. Turn down the heat to very low and add the wine and honey. Cook for as long as you like, letting the chorizo soften and the sauce reduce down into a syrup. Add a little more wine or water if it becomes too thick. Spoon into a dish and dive in with the bread! Another super easy tapas recipe that would go great with paella. Definitely get raw prawns for this, they absorb the flavour so much better. This is a chilli and garlic one, but I love doing a salt and lemon version too. Heat the olive oil in a frying pan over a high heat. Add the garlic and chilli to the pan and fry, keeping it moving so it doesn’t burn. When the garlic and chilli are softened and heated through and you can start to smell them, add the prawns to the pan and stir to coat with the oil. Cook for a minute or two. Using tongs, turn the prawns over. They should have pinkened on the side that was against the heat. Continue to cook until the prawns have turned completely pink. Serve! If having as a starter rather than a tapas, try putting them on a layer of rocket and serving a wedge of lemon on the side. Now, TC says one of the things I’m best at is my salads – apparently I do “unusual things to them”. Well, mostly it’s by adding some odd stuff as a dressing, so here’s one of my basic ones. Usually you’d combine oil with vinegar at a 3:1 ratio, but I love my vinegar and oil is the less healthy part, so I use a higher ratio of balsamic. Feel free to tone it down if you prefer. Whatever you do, use a good quality olive oil for this, and never ever substitute with vegetable. It’s the herbs that make this truly special. This combo is great for a Mediterranean meal, but definitely experiment if you’re going for a different vibe. And it’s not just good on salad, get some of that crispy bread and dunk it in there! It keeps quite well too, so don’t go pouring your leftovers away, save them for the next time you have salad. Put all the ingredients in a bowl and mix thoroughly! TC made the salads (and didn’t keep track of what he put in them), so I’ll have to share my recipes for those at some other point. The rest of it was mostly from Sainsburys! Keeleigh and Kyle brought the sausages, and the cured meat was two different deli packs – chorizo and milano, and Italian antipasto. I love the deli meat packs as it just gets a bit more variety in your buffet than having a lot of the same type. We served two types of bread – the par-cooked bread rolls that you heat in the oven until crispy, and some delicious onion and gruyere focaccia which I definitely wish I’d ordered more of, also heated. We also had some really tasty salt and pepper crackers that matched perfectly with our cheese. Speaking of the cheeses, we had some brie and some mature cheddar (fridge staples), as well as some manchego and some semi-hard goats cheese that I’d picked up from the farmer’s market. We gorged on food and lazily watched Murray take home the Wimbledon title. What would you serve at a Wimbledon themed party?